When it comes to weather Hawaii is truly unlike anywhere else on the planet, and one of the most mystifying concepts for Maui visitors to wrap their head around is the way in which Maui's weather systems work. Since we know that Hawaii's weather and surf forecasts are somewhat different than those in other parts of the world, we offer this guide to help you better understand the reasoning behind what's happening when you step outside. Of all the weather components in Maui, wind is perhaps the most important—yet least understood—part of Hawaii’s weather. Understanding Hawaii's wind patterns will explain why it can be windy in Ka'anapali or Kapalua, but completely calm in Lahaina just three miles down the road. To begin with, Maui really only has two types of wind: Tradewinds, and kona winds. With respect to compass points, if the wind is coming from anywhere in the NE quadrant (0°-90°), then this is what’s known as the tradewinds. What direction the tradewinds are blowing from makes a HUGE difference, although we will get into that later. The tradewinds are Maui’s most common wind and blow for about 80% of the year. The summer months of April-October are when the tradewinds are the most consistent, usually blowing somewhere in the 10-30 knot category (12-36mph). 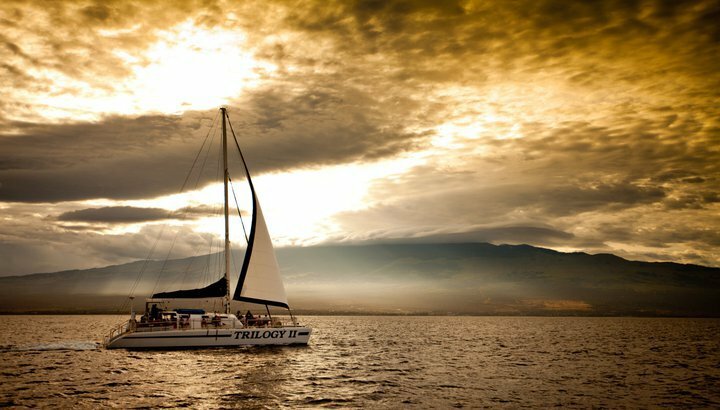 What this means for your Trilogy trip is that on excursions such as our Molokini snorkeling trip, our Ka'anapali snorkeling trip, and our Ka'anapali sunset sail, you can pretty much guarantee that we are going to have ample amounts of wind to sail with towards the end of the trip (particularly Molokini). The tradewinds can also blow during the winter months, although the pattern is often interrupted by periods of kona winds or days in which there is hardly any wind at all. The other 20% of the year is categorized by periods of “kona” winds when the winds switch directions and blow out of the south or southwest. Kona winds are often lighter than tradewinds and usually are only in the 10-15 knot range (12-18 mph). Kona winds are more common during the fall and winter months, and it’s the kona winds which carry the sulfur dioxide known as “vog” up from Kilauea on the Big Island, thereby turning the air hazy for a few days until the tradewinds turn back on. Ok, so there are tradewinds and kona winds, but what does the direction of the wind have to do with anything? With respect to Maui sailing and snorkeling, the direction in which the wind is coming from is ultimately more important the overall strength of the wind. Why is this? It's important to remember that wind is--in its simplest form--air moving from one place to another. All of this air is moving through the Pacific unobstructed for thousands of miles, and then suddenly it encounters all of these tall mountains which need to be navigated. When wind encounters a large mountain, such as Haleakala, it doesn't just choose to go around one side or the other, but instead, it splits the mountain and passes along both sides of it in the same way that water moves around a rock in the middle of a stream. Also, when air passes between two large mountains, there is a funneling effect known as a venturi which actually strengthens the wind as it passes through a narrow channel, such as one located between two islands. Consequently, a 20-knot wind out of the north will have a completely different effect on where it's windy than a 20-knot wind out of the east will, because the air is funneling and moving from a different location. I'm confused. Explain it to me more. Let's look at these pictures: This is, for the most part, what an east wind will look like on Maui. Notice the way in which areas such as Molokini and Lahaina are sheltered from the wind, and areas such as Ka'anapali and Kapalua are exposed to the trades. On some occasions, when the east wind is strong enough, it will also weave its way through the valleys of the West Maui mountains at places such as Olowalu. When the wind comes out of the north, however, the situation looks a little bit different, despite the wind being the same speed. Notice that in this situation it's not possible to snorkel at Molokini because the north winds blow directly into the crater. Consequently, most snorkel charters during periods of north winds wil instead head to areas such as Olowalu or Launiopoko which lie the slight bit of a lee which might exist. Now that we know the influence the wind direction can have on Maui's waters, it's important to remember that in almost all instances the wind doesn't start blowing until late-morning or early afternoon. If you're wanting to snorkel, surf, stand up paddle, or just go for a run down the beach, it's often best to be outside before 10am when the wind will gradually start filling in. Now that we understand what dictates Maui’s wind conditions it’s much easier to understand the difference between the island’s windward side and the leeward side. In their simplest terms, windward is the side from which the wind is blowing and leeward is the side which is shielded from the wind. When sailing, if the wind is coming over the port (left) side of the vessel, the port side is known as the windward side and the starboard (right) side is known as the leeward side. As it happens, the same concept applies to islands. Since Maui’s tradewinds blow out of the northeasterly quadrant for the majority of the year, Maui’s north and east shores are classified as the “windward” side, and the south and west shores are classified as the “leeward” side. To brush up on geography, this places areas such as Hana, Kahului, Makawao, Wailuku, Kapalua, and Napili on the island’s windward side, whereas ares such as Wailea, Kihei, Maalaea, Lahaina, and (barely) Ka’anapali are tucked on the island’s leeward side. Since towns on the windward side of the island are closer to the wind, they consequently are going to be windier than those on the leeward side of the island. This much we learned in the last section. Oftentimes, however, moisture in the atmosphere is carried in on the northeasterly tradewinds and therefore makes the windward sides of the island not only windier, but also wetter. This is why areas such as Kapalua receive more rainfall than areas such as Lahaina. In fact, Kapalua actually receives about 30 inches of rainfall per year, whereas Lahaina—which is only nine miles away—receives about 10. Why such a big difference in such a small area? The answer has to do with something known as “microclimates”. Unlike areas on the Mainland which are prone to frontal storm systems which stretch for thousands of miles, Maui’s weather is instead dominated by various microsystems in which the weather can change over the course of less than a mile. Due to the fact that our mountains rise so steeply from the sea the island is heavily impacted by elements of windward , leeward, and the resulting rain shadows. To cite the example from above, the difference between Kapalua and Lahaina is that Kapalua lies on the northern tip of the island, and since it isn’t tucked behind a steep mountainside it’s exposed to the northeasterly wind and rains. Granted, this also accounts for it being much cooler and greener on this part of the island, whereas Lahaina can swelter when Kapalua is cool and comfortable. An example of a Maui microclimate. Notice how it's sunny in Lahaina but raining in the mountains only 1 mile away. If you look at the compass points on a map, Kapalua faces about 340°, thereby placing it in the NW quadrant. Napili is at about 300°, Ka’anapali is 270°, and Lahaina is about 210°, thereby placing it in the SW, or leeward quadrant. Similarly, areas such as Kihei and Wailea lie in this dry, SW quadrant, whereas the road to Hana at 45° is right in the middle of the NE quadrant—the wettest of all, which is something that explains all those dense rainforests and towering waterfalls! One mistake which many visitors to Maui make is that when they check the weather forecast for their upcoming vacation, they will choose a weather site which only displays the forecast for the Kahului Airport on the windier--and wetter--windward side. Consequently the forecast will almost always call for showers. Don’t be discouraged, however, because chances are the weather in resort areas such as Wailea, Kihei, Lahaina, or Ka’anapali, will be experiencing a completely different (often sunnier) forecast than what’s being displayed. For a more accurate weather forecast we recommend reading local weather sites such as Maui Weather Today which breaks down the island’s weather forecast by its various regions. Although microclimates control the majority of Maui’s weather pattern, they don’t however, dictate the weather 100% of the time. During the winter months Maui can be affected by big cold fronts in the same way that areas on the mainland can, and if a large cold front in the North Pacific (the same storm systems which will eventually drop snow and rain on the west coast of the US) decides to swing south enough, this front can move across the island chain and bring rainy weather to every part of the island. While these fronts oftentimes dissipate over Kauai and Oahu before reaching Maui (and thereby make Kauai and Oahu wetter than Maui), occasionally the front will envelope the entire state and bring up to a week of rain. This, for us, is winter. We might not get snow (well, Haleakala might), but Hawaii is still prone to winter storms which bring a lot of rain. While no one wants to have a week of rain on their vacation, understand that visiting the islands in winter is a gamble everyone takes. In the same way that a “normal” winter day in your hometown might include sun or it might include snow, a “normal” winter day in Hawaii can be 78° and sunny or it can be 74° and rainy. But at least it’s warm! Since there is nothing you can do to control the weather, winter visitors to Hawaii just need to cross their fingers and hope for the best. Moral of the story on Maui's weather: Don't just look out the window and assume that's how the weather is on the whole island. Unless Maui is in the throes of a large winter storm, there's a good chance the weather is different just a few miles down the road. As anyone who has ever flown to Hawaii has noticed these islands are literally a long way from everything. In fact, Hawaii is the most isolated landmass found anywhere on the planet, with the closest continental point of land (California) being over 2,400 miles away. Given that Hawaii is surrounded by such a vast amount of ocean it’s consequently exposed to the powerful elements of the sea. So how are Hawaii’s waves created? In all parts of the world, waves are simply the effect of wind acting upon water, and the stronger the wind blows, the larger the waves are. Other factors such as the speed at which the storm moves and the distance from a given point of land are also complicit in a wave’s eventual size, but for the most part, it’s the strength of a storm which determines the size of the resulting wave. Since waves are simply columns of energy moving through the water this energy will continue unabated until some outside force (such as a reef or an island) gets in its way to slow it down. Like a stone dropped into a placid pond, the waves emanate out from a storm source in concentric ripples which can last for days. What can sometimes be confusing for Hawaii’s visitors, however, is that there can be no wind at all and the waves are still 20 ft high. How is that possible? The answer lies in the fact that, in the majority of circumstances, Hawaii’s waves are formed by storms which spin thousands of miles away, and thus are simply too far away from the islands for us to feel the winds. Nevertheless, the islands are still directly in the path of the resulting waves which pass unobstructed across thousands of miles. On occasion the tradewinds can be so strong in the islands they can create their own waves in an effect known as “windswell”, but this is not what generates the gargantuan waves that Hawaii is famous for. Instead, the majority of Hawaii’s waves are formed by large storms spinning in the outer reaches of the Pacific, most of which occur during winter. When—and where—these waves show up, however, forms a crucial part of Hawaii’s recreational calendar. Given that Hawaii is located in the Northern Hemisphere (roughly in line with Cabo San Lucas, Mexico), when it’s summer in Hawaii, it’s summer in the rest of the North Pacific. Beachgoers from Hawaii to California to Alaska all bask in the warmth of the summer sun, and the northern Pacific Ocean is relatively calm. In the Southern Hemisphere, however, large winter storms churn violently across the Southern Pacific, oftentimes just to the east of New Zealand. With winds which can reach up to 100 mph these storms generate large waves which begin their march across the ocean. New Zealand, however, is 7,000 miles away from Hawaii far off to the southwest. Also, before the waves from this storm can make it to Hawaii they must first pass through a slew of South Pacific islands such as Fiji, Tonga, and Samoa. By the time these waves reach Hawaii they have traveled over 7,000 miles and much of their energy has been absorbed by other island chains. Consequently, it only takes an 8 ft. wave face to trigger a high surf advisory on a south facing shore. So what places on Maui are affected by a south swell? Depending upon the exact direction, beaches in Ka’anapali, Lahaina, Ma’alaea, Kihei, Wailea, and Makena will see waves during a south swell, as will Hulopo’e Beach on Lana’i. On the other hand, northward facing beaches such as Napili, Kapalua, Honolua Bay, and famous surfing spots such as Jaws will be completely flat during the summer (but most likely windy). When the seasons switch from one hemisphere to the other, so too do the storms which are associated with winter. The larger storms which once blew across the southern hemisphere gradually begin to appear in the northern hemisphere in areas of east of Japan and south of Alaska, and these storms churn up large waves which once again begin their march across the Pacific. The difference, however, is that during these northern hemisphere storms Hawaii is only 3,000 miles away from the storm source (as opposed to 7,000 miles away), and there aren't any other islands in the way to absorb the energy. Consequently the waves which reach Hawaii's north and west facing shores in the winter months have only traveled half as far and are reaching Hawaii at full strength. This is when Hawaii gets its famous big waves on the north shore and surf spots such Jaws, Ho'okipa, Honolua Bay, Pipeline, and Waimea Bay begin to gradually roar to life. The same beaches which were flat calm in the summer can now see surf that towers over 30 ft, all because of the change in the location of Pacific storms. Given this difference, it take s a 15 ft. wave to issue a high-surf advisory on a north or west facing shore. So what places on Maui are affected by a north swell? Because the waves are coming from a different direction, north swells will affect Honolua Bay, Kapalua, Napili, and even Ka'anapali. North shore beaches such as Kanaha, Baldwin Beach, and Paia Bay will all have surf, and this is the time of year when it's best to go to Ho'okipa or Jaws to see the world's best surf some of the largest waves on the planet. Meanwhile, "summer beaches" around Lahaina, Hulopo'e Bay (Lana'i), Olowalu, Kihei, Wailea, and Makena will all be calm and flat, although occasionally if a winter swell has a lot of west energy in it then Kihei and Wailea can be prone to a small amount of surf. Does this mean that for the entire summer I can't snorkel on the south shore, or for the entire winter I can't snorkel on the north shore? Not at all! Since waves are the product of storms thousands of miles away, these waves will only last for a couple of days as the storm moves its way across the Pacific. There could be 8 ft. surf in Lahaina on Monday, and by Thursday it could be completely flat again. Just because it's the season for surf doesn't mean that that waves are a guarantee, just that this is the time of year when there is the possibility of waves. In fact, there are "flat spells" during the summer months where Lahaina won't get any waves for an entire month, even though it's "in season" for it. Much the same as during winter on the mainland, just because it can snow in winter doesn't mean it's going to. It just means that if it's going to snow then this is the season when it's going to happen. The same goes for Hawaii's waves. Whew! Ok, well a sign at my hotel says that high-tide is going to be at 3:15 p.m. today. Does that mean that's when the waves are going to be the biggest. No, although it can be confusing, tide and waves have very little to do with each other. Tides are the result of the moon's gravity, and have nothing to do with the storms which serve as the waves' original source. Let's say the entire Pacific Ocean is a swimming pool, and someone left a garden hose running which led straight into the pool. The resulting rise in water would be a low tide. When someone comes flying out of nowhere and does a cannonball in the deep end of the pool, and consequently sends waves emanating the full length of the pool, that would be the storm and the resulting waves. Tides have to do with how much water is in the ocean, waves (or swell) have to do with the energy within that water. While most places in the world measure waves by the size of the face, Hawaii uses its own system of measurement by instead referencing the size of the wave's back. The resulting ratio is about 2:1, so if a wave is measured as being "4-ft. Hawaiian", then that translates into an 8 ft. wave anywhere else in the world. This is an important difference to understand because many surf forecasting sites in Hawaii still measure a wave by the back, so if you see in the Maui News that the waves are only going to be 3 ft., understand that those waves are much larger than you think. For surf forecasting, Trilogy recommends either Maui Weather Today (Hawaiian measurement), and OMaui (face measurement). While everyone wishes they could bask in perfect weather on a daily basis (and often we do! ), the reality is that despite being a tropical island there are still natural forces much larger than us which dictate the conditions when we step outside the door. Understanding these conditions can help you properly plan your activity schedule, offer you the best chance of success on your trip, or help keep you safe throughout your vacation on Maui. Want even more info on Maui weather? You can like us on Facebook and Instagram, or follow us on Twitter. Feel free to be in touch as we love helping visitors plan their Maui vacations. Mahalo for interest in Maui, and should you be interested in our range of Maui sailing and snorkeling charters we look forward to sailing with you soon!